NEW HAVEN, Conn. – Emily Balasco (Seekonk, Mass.) 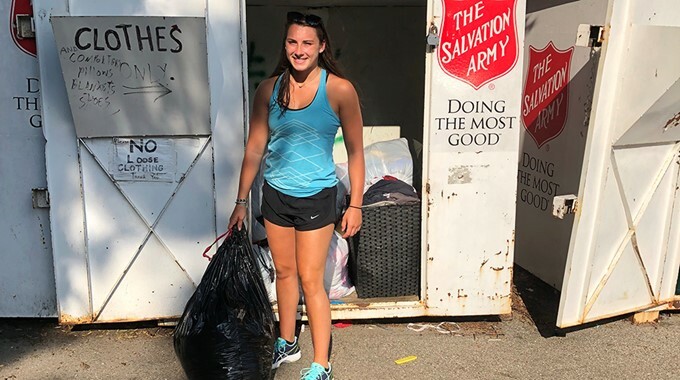 of the Southern Connecticut State University gymnastics team recently donated items to the Salvation Army near her hometown in Massachusetts. This is just one example of many community outreach events that SCSU student-athletes take part in on an annual basis. SCSU student-athletes volunteered roughly 2,500 hours of their time to numerous outreach efforts, both on-campus and in Greater New Haven, during the 2017-18 academic year.